Blogger is jacking me around tonight and this is now the third time I've written up this blog post - argh who had time for that! Ok, now to recall what I originally wrote for the third time. Move nails time. 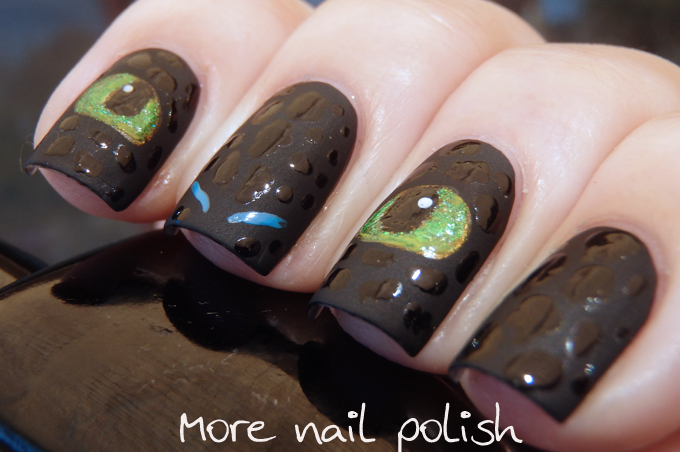 This was one of the few manis I had planned from well before the beginning of the challenge. The last movie I saw at the movie theatre was How to Train Your Dragon 2, during the last school holiday's with the kiddos. My kids are obsessed with the two movies and the TV series. They know every dragon by name, every dragon species, ever character and most of the episodes word for word! You can imagine that I was pretty pleased with myself when I showed my nails to the kids and they both excitedly squealed - TOOTHLESS NAILS! If you are a cat lover and you have not seen these movies, particularly the second one, they you have to check it out. It's very clear that the animators got a lot of feline inspiration for this cute little fellow, because I can't believe how cat like Toothless is. He is just adorable and makes me wish he was real and that I was his dragon rider! Here are my nails. I did a black base and topped that with OPI Matte Top Coat. 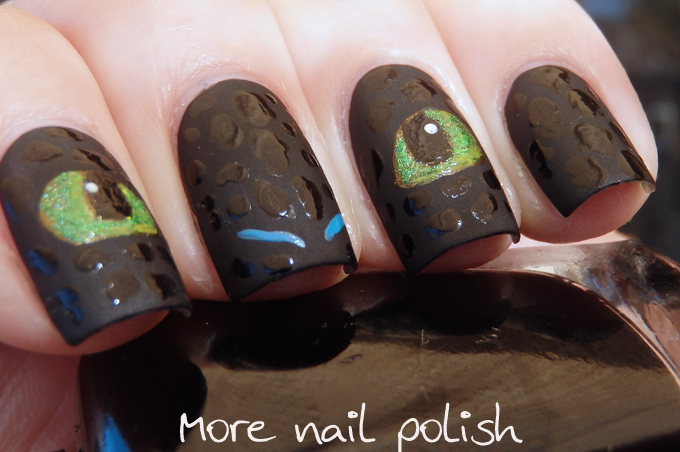 I then painted the eyes on free hand using a mix of a few yellow and green polishes. I then added the black pupils and the white highlight dots. 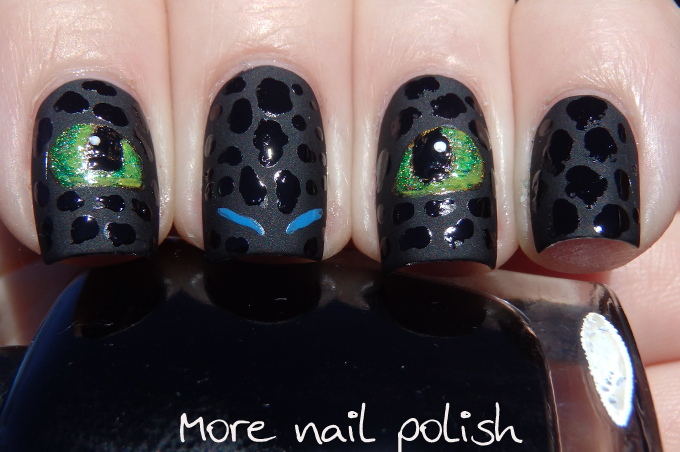 For the spots, I just used my dotting tool and did random shaped blobs using Seche Vite top coat. This is the picture I used for inspiration. 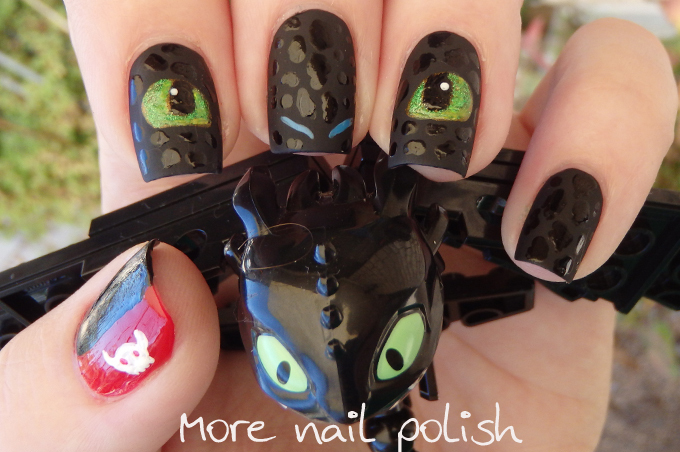 I painted my thumbs half red half black to represent Toothless's tail, and I painted the insignia on the red part too. My Inspired by a movie nails from 2013! I....wow. Well, I think I just figured out what I am mimicking for the "honor nails you love" day of the challenge. Wow. omg, these are so AWESOME. *EXCITED YELLING NOISES* I haven't been commenting as much lately b/c I've generally fallen behind- I have been reading your posts on my bloglovin' phone app, so commenting is a bit tricky. But gosh, these nails are breathtaking! 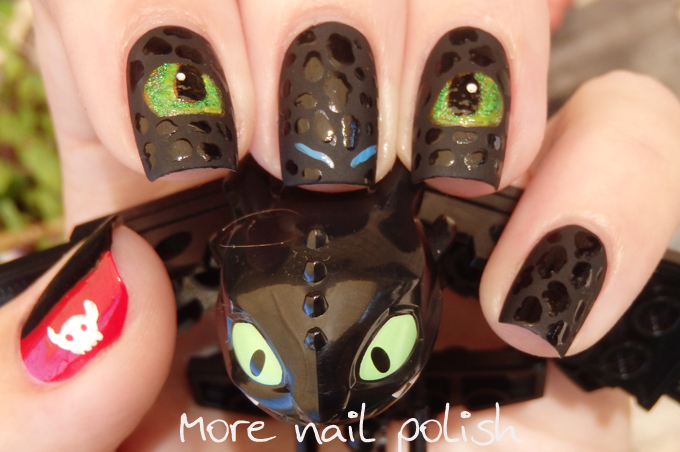 I may also have a giant soft spot for Toothless and Hiccup. Maybe the size of my entire heart. But these are gorgeous nails!